Android N: Best Features and Improvements! 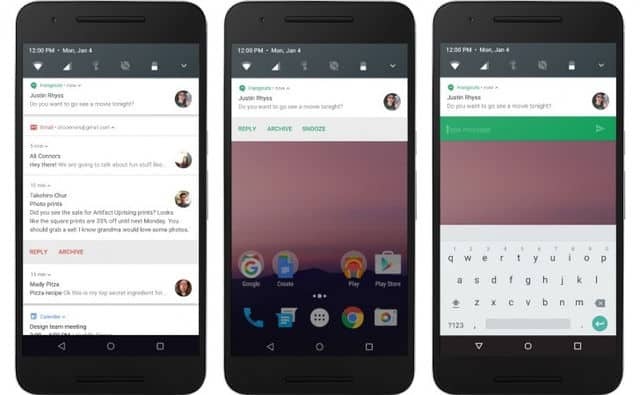 So Google today just pushed out the Android N Dev Preview to its Nexus phones and already many people are using this. The new android does offer some pretty cool improvements and new features which are still in beta mode and needs more polish. Also, the new version of Android is quite furious and fast! Meanwhile, we have listed the best of the best features and improvements Android N Dev Preview has come with! Well, Doze was arguably one of Marshmallow’s most interesting features, putting your phone into a deeper sleep to conserve battery life after a period of inactivity was a awesome idea! The only problem: your phone would only doze when you let it sit, unmoving and untouched, for a specified period of time. But most people walk around with our phones in our pockets, not sitting on a table all day, which means it won’t doze very often. There were ways to improve this feature, but they didn’t do what we all really wanted and resulted in a laid back. But, Now in Android N, Google has improved the feature to save battery while on the go! The firm says that with new restrictions to apps it can save battery when carrying the devices in their pockets. “A short time after the screen turns off while the device is on battery, Doze restricts network access and defers jobs and syncs,” says Google. It points out that on turning the screen on or plugging in the device will bring the device out of Doze automatically! Well, that’s the feature we all were wanting to come! 2. ADDITION OF DATA SAVER! This was one of the most haunted feature on Stock Android for long and it finally arrived. The all-new Data Saver mode, which actually helps reduce cellular data use by apps. With the new Data Saver facility, users will get more control over how apps use cellular data! Once the Data Saver mode is enabled on your phone, the system will block background data and will also signal apps to use less data wherever possible. Users will also get an option to select specific apps to run in the background and use data even when Data Saver mode is enabled! Sounds amazing, doesn’t it? 3. QUICK SETTINGS JUST GOT MORE CUSTOMISABLE! We did see this feature on the CM13 based ROMs and it was quite handy. But now Google itself pushed this amazing improvement to its Stock OS and its great! So with Android N, a paginated view is now included, allowing users to have many more settings available on a whim as ever before! For users who wish to customize the placement of the tiles, its pretty easy now with dragging and dropping a tile where you want it to go. One drag opens the notification drawer, as usual your first five Quick Settings are available along the top, without having to drag down a second time. That’s highly convenient and handy! You can drag a second time to show the full drawer, which was present on the earlier versions as well. But, in Android N, you can edit which Quick Settings show up in the drawer–removing ones you don’t want, or rearranging them to suit your tastes which also was possible in Marshmallow using a secret menu, but it seems to be the default action in Android N.
This is a unique feature that came with the Android N Dev Preview. With the addition of Direct boot, Android N will improve device startup times and will allow registered apps to have limited functionality even after an unexpected reboot! For example, if an encrypted device reboots while the user is sleeping, registered alarms, messages and incoming calls can now continue notify the user as normal. This also do means accessibility services can also be available immediately after a restart which is pretty awesome! Thanks Google! Now, The notification shade looks a bit different in Android N but it comes with a few new features, too. Finally Developers can now include “direct reply” feature in their apps, so you can reply to a message without opening the app itself–much like Google’s own apps can already do like Hangouts as a example. Also, Google is revamping the Android notification system to put emphasis on a hero image and avatar. This means that whenever a notification is signed with an image, such as a profile picture or Cover Photo, you will be able to tell who it is very easily. On top of that, Android N introduces Bundled Notifications, much like wee see with Android Wear. Allowing the system to group messages together, it provides a cleaner more readable experience for users! Quite amazing! Previous articleTop 5 Gadgets to turn your home into a smart home!